In stock -This product will ship today if ordered within the next 12 hours and 17 minutes. 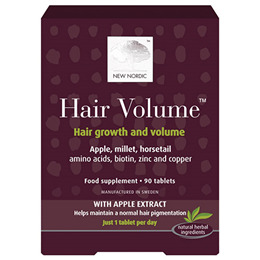 Hair Volume is the tablet you need to maintain a normal voluminous hair growth. The unique bioactive nutrient hair growth factor combination contained in each tablet nourishes and activates the life processes of hair follicle cells. The tablet works from the inside out. The tablet, which is manufactured in Sweden contains micronutrients and herbal extracts including apple extract rich in procyanidin B2. The content of biotin and zinc contributes to the maintenance of normal hair and copper contributes to normal hair pigmentation, fighting grey hair. Filling agent (microcrystalline cellulose), apple extract (Malus domestica Borkh. ), millet extract (Panicum miliaceum L.), horsetail extract (Equisetum arvense L.), L-cysteine, L-methionine, water, vitamins (calcium D-pantothenat, D-biotin), coating agents (magnesiumsalts of fatty acids, hydroxypropylmethylcellulose), minerals (zincoxide, cuprisulphate), disintegrator (crosslinked sodiumcarboxymethyl cellulose), anticaking agent (silicondioxide). Take 1 tablet with a glass of water. Caution: Seek professional advice before using if you are pregnant, breastfeeding or suffer from allergies. Warnings: Not suitable for children under 12 years of age. Below are reviews of New Nordic Hair Volume - 90 Tablets - Best before date is 30th June 2019 by bodykind customers. If you have tried this product we'd love to hear what you think so please leave a review. I have been using this product for some time now. I find that it has no effect whatsoever on my hair growth or its condition. However, I find that it is marvellous for my nails. My nails are very weak and bendy, not even strong enough to break properly but just peel away from my nails. I am now using just for the benefit of my nails.